The Yamaha SPX990 Professional sophisticated digital reverberation and effect systems which offers 80 preset effect programs including accurate simultaneous natural reverberation and early reflections, delay and echo effects, gated effects, a versatile compressor, delay harmonic driver, multiple effects, freeze (sampling) programs which can do loop playback and others. Epoch-making new effect like the main effect programs include multi-tap delay which can determine each level of time and balance, the round pan and intelligent pitch which can add harmony through internal recording on specific keys and scale. The temp, stereo echo and temp, quad echo also add new attractive effects to the Yamaha SPX990. With a sampling frequency of 44.IkHz, the Yamaha SPX990 delivers full, flat frequency response from 20Hz to 20kHz for exceptionally clean, “transparent” effect sound and direct digital interfacing capability making it compatible with the most up-to-date sound system. The preset effect programs can be edited, re-titled and stored in any of the 80 RAM memory locations. 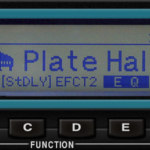 Individual 3-band parametric EQ and dynamic filter parameters are provided for each effect program for precise tonal tailoring. In addition to the basic effect and EQ parameters, the Yamaha SPX990 offers a list of “internal parameters” which provide exacting control over the effect sound. The Yamaha SPX990 is also MIDI compatible, with a MIDI IN terminal that allows MIDI selection of effect programs and a switchable MIDI THRU/OUT terminal. When switched to OUT, edited programs stored in the internal RAM can be dumped to a MIDI data recorder or other data storage devices. Programs thus stored can be reloaded when necessary via the MIDI IN terminal. As an extra touch of convenience, the Yamaha SPX990’s analog input and output terminals can be switched to match -20dBm or +4dBm line levels, providing compatibility with a broader range of sound equipment. Convenient external data storage is provided by a card slot that accepts optional RAM cards that can be used to store effect programs.